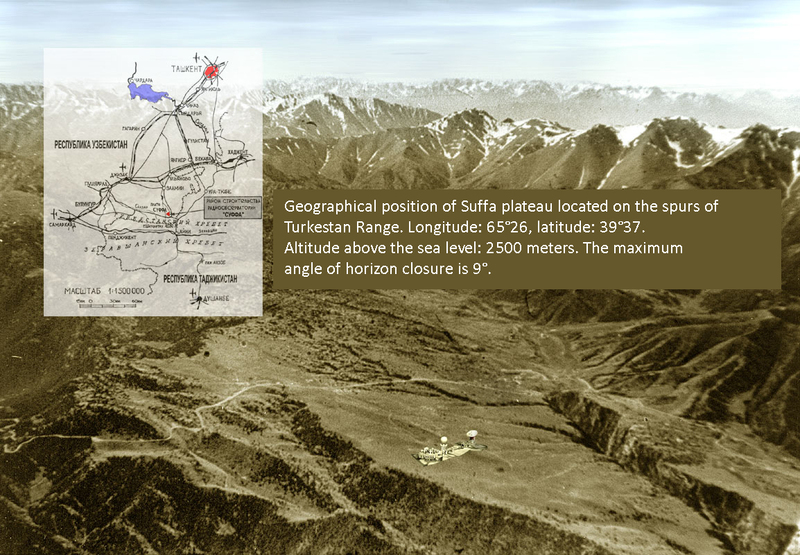 RT-70 radio telescope is being constructed on a high plateau Suffa in spurs of the Turkestan Range in Uzbekistan. Operating frequency range of the received radiation is 5–300 GHz (6 cm–1 mm). Given the unique astroclimate of this region, the radio telescope will operate mainly in the short part of the millimeter waveband. It was found that in the spectrum of cosmic electromagnetic background in the range of 0.4–10 mm dominated a cosmological microwave background radiation described by the Planck temperature of 2.73 K. This corresponds to an absolute minimum of the brightness temperature over the entire spectrum of the background radiation. To the cosmic microwave background radiation is also added a terrestrial radio telescope own radiation as well as the atmospheric and Earth background radiation. The spectral distribution of the intrinsic radiation (and, accordingly, absorption) is determined by the concentration of gases in the Earth´s atmosphere. This is mainly water vapor, oxygen and nitrogen. The figure shows the spectral distribution of the absorption in the Earth´s atmosphere. Accessible for ground-based observations (2500 m above the sea level) "windows" of transparency determine the choice of frequencies for RT-70 radio telescope. Fig. Theoretical dependency of the absorption coefficient from the frequency of radio waves in the Earth´s atmosphere at normal conditions. Millimeter waves are actively developed and have already provided important information for cosmology and extragalactic astronomy, physics of galaxies, galactic objects and the solar system. Ultra-high resolution and high sensitivity of the radio telescope will allow studying in detail a number of stars with planetary systems. In this wavelength range, the effect of ISM scattering is very small; this provides an opportunity of obtaining the images of ultra-compact objects, high-precision measurements of their coordinates and motion parameters. Research can be conducted in a continuous spectrum, as well as in molecular lines, and include polarization measurements and observations of variable objects. 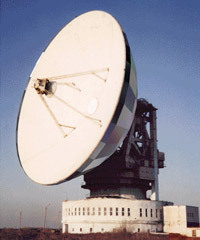 Radio telescope RT-70 will operate in two modes: single-dish and in radio interferometric mode with the network of ground and space telescopes. The favorable geographical position (nearest comparable radio telescopes – in Japan with a diameter of 45 m and in Spain with a diameter of 30 m.) plays important role during the operation in a global radio interferometric network. Radio telescope RT-70 in the complex of Suffa Observatory will be the main ground support point of “Millimetron” project.